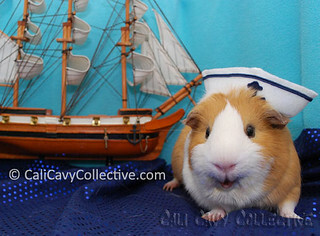 For Halloween, Peaches has decided to dress up as a sailor pig. She is captain of the USS Lettuce, pictured in the background. Peaches will be embarking upon a journey to sail across the Cavian Sea in search of the Endless Fountain of Food. "Ahoy, matey!" 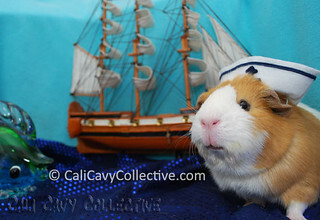 wheeks Captain Peaches at her furry crew. But little does she know... a sea monster has scented the fragrant smell of carrots Peaches has stored in the ship's hold for the journey. Peaches battles the giant sea monster for her precious carrots, and wins! The carrots are saved, and the crew rejoices, blissfully unaware that the monster dropped something during his hasty retreat... something that can only spell trouble ahead for Captain Peaches. 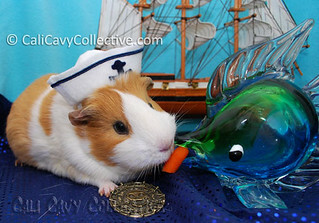 Now sailing on HMS Angry Carrot OTR with Dido, Captain Pig & Adm Pinky. 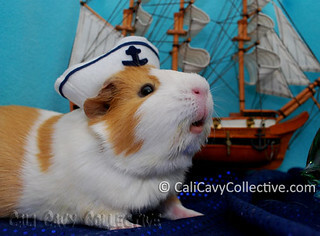 Peaches looks adorable with her sailor hat, we look forward to reading more of her adventures. Vegan Wheekers - Sadly, no :( Captain Oatmeal was before Peaches time, we would love to hear these piggy legends though! Mopsy LOL excellent ship name! Very fitting for conquering mauraders such as Admiral Pinky, whee bet Boomer would approve.